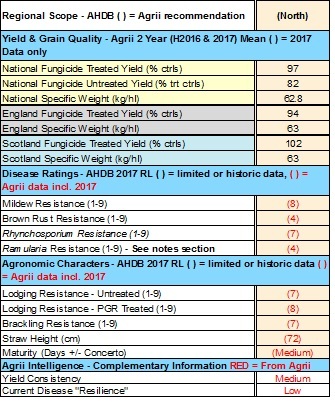 A feed variety that is particularly well adapted to the North where it has outperformed Waggon on yield in Agrii’s Northern trials. As its name suggests it has one of the best ratings against the wet weather disease, Rhynchosporium. A stable variety with very consistent yields over the past five years and produces a good sample but screening losses are on the high side. Stiff straw which is slightly shorter than average and excellent resistance to Brackling. Medium maturity, very similar to Hacker. In addition to its strength against Rhynchosporium, its Mildew resistance is also good, which is important in the North while its weakness on Brown Rust is less so. It is relatively susceptible to Ramularia so this needs to be monitored and controlled as appropriate.